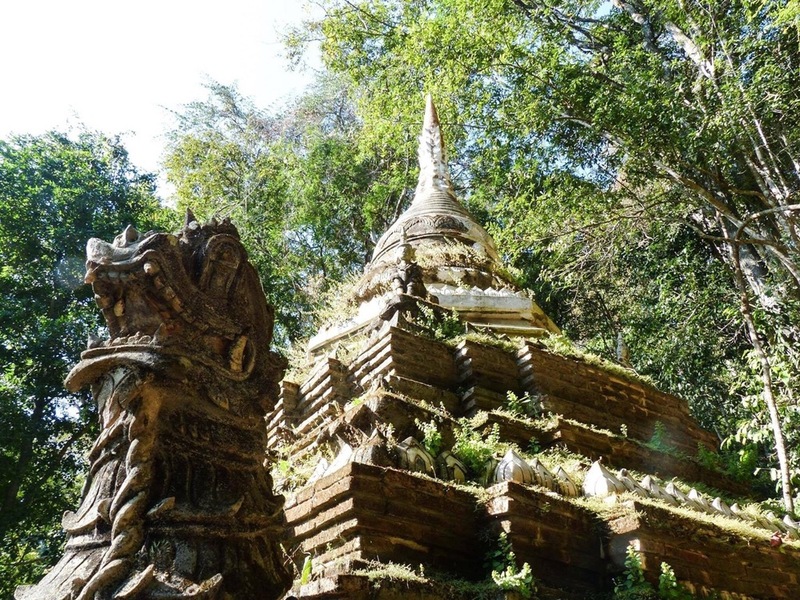 If you're looking to escape the city, try hiking the Monk's Trail up to Wat Phra That Doi Suthep. 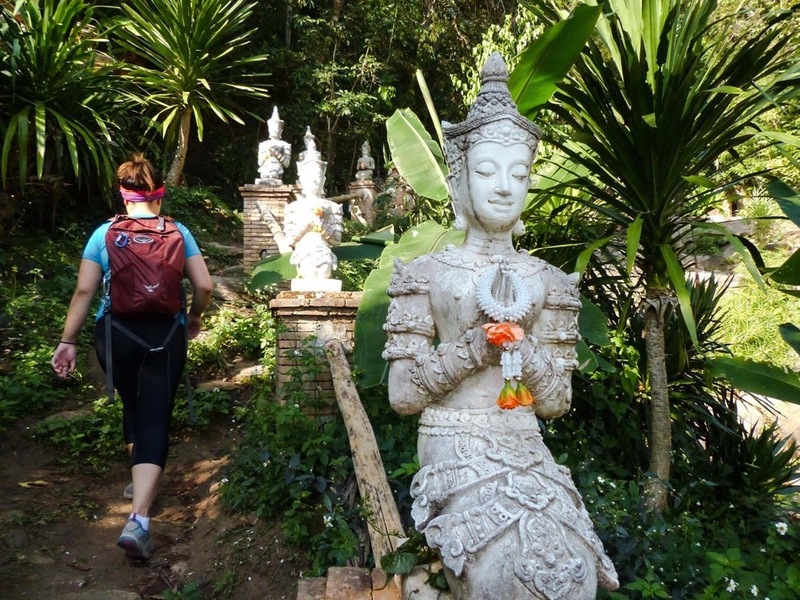 The two hour hike takes you through a jungle to Wat Phra Lat Temple before a strenuous hike uphill to Wat Phra That Doi Suthep. The entrance of the trail starts at the end of Doi Suthep Road, past Chiang Mai University and behind Chiang Mai zoo. We took a red truck (red songthaews) to this point (20 baht each). This can be confusing to explain to a driver, since he originally took us to the wrong place. Just make sure you say Doi Suthep Road! When you reach the end of Doi Suthep Road, go right and continue past the signs for Chiang Mai Zoo. From here, the road will take you uphill for 5-10 minutes. Along the way, you'll pass a building on your left. Hike past the signs for Chiang Mai Zoo. Just keep walking on the road for a few more minutes and you'll reach the entrance of the trail. You know you're there when you see the red and white TV Tower on your right. There will be orange cloth wrapped around the trees to mark the entrance. Entrance of the Monk's Trail. The 30-45 minute hike to Wat Phra Lat Temple is a little rocky, but heavily marked. Monks frequent the trail, so it is well maintained. The trail itself isn't too difficult, as you can see many people hiking in sandals. Once you reach Wat Phra Lat Temple, you can enjoy a break on the rocks. The atmosphere is very serene and tranquil as the temple is situated in a jungle by a river. To get to Wat Phra That Doi Suthep, it's going to take an hour and 15 minutes from this point. When you're ready, head back to the trail. The trail will lead you up a steep section up to the road. Once you reach the road, head left along the rail. Look out for a yellow arrow painted on the road pointing across the street. Cross the street at this point and you should see an orange cloth marker on the tree. This trail isn't as consistently marked, but well-travelled. So, watch out for any yellow paint markers on the ground. There's one section where you'll reach a fork in the trail. Take a left at this point. The trail will eventually turn into clay stairs until you reach the road, so get ready to walk up some steps. Beginning of the trail, after crossing the road. Once you reach the road, make sure to walk up the shoulder to get to Wat Phra That Doi Suthep. We were advised against taking the trail to the right of the road due to aggressive wild dogs. However, it's up to your own discretion. Make sure to pack plenty of water, sunscreen, bug spray and snacks.